Hop aboard a catamaran for a fun and scenic trip along the coastline of beautiful St. Kitts. It's a great way to enjoy the turquoise waters and beautiful weather without jumping in the ocean yourself. Combined tour. Very interesting. Think we enjoyed the Catamaran part a bit better, but was all fun! We do this excursion every time in St.
We do this excursion every time in St. Kitts. Love being on the water, the crew is great. The lunch and rum drinks are good. The beach on Nevis is small but clean and usually uncrowded. Windy day meant beach location had to be changed so was disappointed with beach option offered. Windy day meant beach location had to be changed so was disappointed with beach option offered. I realize the change was made due to safety; but was disappointed because was looking forward to beach time. The "sail" back to the pier in Basseterre was directly upwind so we proceeded under power. The "sail" back to the pier in Basseterre was directly upwind so we proceeded under power. Rum punch was free, though. Catamaran to Nevis Island. Snorkeling. Delicious Caribbean lunch on board. Open bar. Pinney&apos;s Beach break. Great Breeze, great sites, and great fun. Did this last year and it was awesome again. Had never sailed before and on the trip back from Nevis, they put up the sails. Had never sailed before and on the trip back from Nevis, they put up the sails. It was great. We did the Catamaran Sail and Snorkel. Catamaran to Nevis was amazing! Catamaran snorkeling your with a beach stop on Nevis. 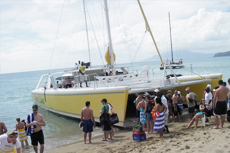 Catamaran snorkeling your with a beach stop on Nevis. Great trip all round, tasty lunch and fun crew. This was the catamaran and snorkel. This six hour excursion was very enjoyable. This six hour excursion was very enjoyable. The crew was fun and entertaining. We enjoyed snorkeling and swimming and cold beers and rum punch. Beautiful sail to Nevis Beach. Beautiful sail to Nevis Beach. Rum punch or beer and a bBQ lunch. 35 people on the tour, lots of room and the drinks were flowing! 35 people on the tour, lots of room and the drinks were flowing! This was a LONG day but very fun if you enjoy sailing. We stopped to snorkel at a popular spot. Lunch was good, chicken, pasta salad, banana bread, rice/beans. Looked the excursion Sail away to Nevis. Looked the excursion Sail away to Nevis. We didn&apos;t get to go to Nevis do to the height of the waves but we got to see other beaches of St. Kitts. This was the second half of our "rail and sail" excursion. We took a 6-hour catamaran tour and had the time of our lives! Beautiful catamaran, crew was friendly and attentive. This was our favorite excursion, we had so much fun. This was our favorite excursion, we had so much fun. Snorkeling was awesome and the 2 guys who ran it were so great. gret beach rough snorkeling but that was due to weather fun ride back! !